Penelope Ruth Ballantyne has lived at the tail of the army all her life, experiencing the rigors of life in India, followed by five years of war in Portugal and Spain. Not surprisingly, now that she is orphaned, she accepts the most challenging position available, companion to an invalid who lives on the edge of Exmoor in northern Devonshire. After years of constant travel, Penny longs to settle under one roof, find a true home. Instead, she encounters hysteria, mysterious deaths, a nasty rival, and the constant fear of dismissal as she attracts the attention of more than one young gentleman in the household. Though the only one she truly sees is Robert, Lord Exmere, heir to Moorhead Manor. Together, they face a startling dilemma worthy of the judgment of Solomon. 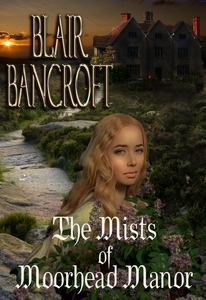 Note from Blair: The Mists of Moorhead Manor is a Gothic novel in the tradition of Victoria Holt, Mary Stewart, Phyllis Whitney, and my previous Regency-set Gothic, Brides of Falconfell.